Core body temperature is the temperature of the internal organs that the body manages through the physiological processes of thermoregulation. It is not a constant temp, as many people assume. It varies normally by a few degrees and can go as high as 104F during heavy exertion. High core temperature increases heart rate and puts a strain on the cardiovascular system, leading to decreased cardiovascular performance. In the extreme, elevated core temp leads to heat related illness and risk of serious injury or death. 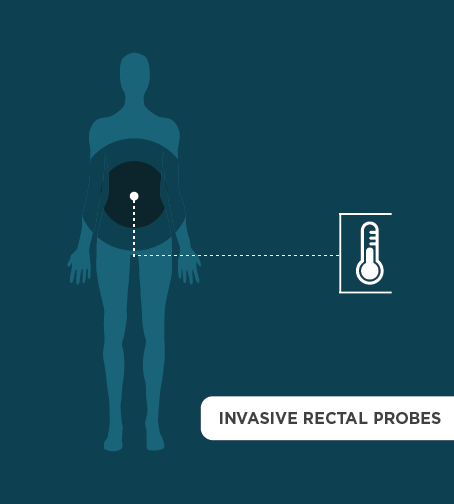 There are many valuable uses for continuous core body temperature monitoring. Infection and disease detection. Monitoring sleep cycles and biorhythms. Performance monitoring, training and safety. Heat illness detection. For professions such as firefighters and soldiers. Where is the Wearable for Measuring Core Body Temperature? Currently there is no non-invasive, wearable, wireless device that can continuously and accurately measure core body temperature in a variety of conditions. This is because the clinical standard for measuring core temperature is via rectal probes - not conducive to physical activity. With patented technology using radiometric thermometry, gaugewear is creating a wearable, non-invasive, core body temperature sensor. Radiometric thermometry determines temperature by passively measuring the electromagnetic waves emitted by the body. We can measure the radio waves emitted from inside the body to determine temperature several centimeters below the surface. All matter emits energy called thermal, or black body, radiation. That radiation follows a precise distribution that is defined by temperature. This is the same radiation measured by infrared thermometry that most people are familiar with. The difference in radiometry is in the frequency of operation. Infrared waves do not pass through the body, so they can only be used to measure surface temperature. By measuring the thermal radiation in the microwave band with an antenna on the skin, we can detect the signal from inside the body to determine temperature several centimeters below the surface. gaugewear’s proprietary technology allows accurate measurement through multiple tissue layers in a small form factor. Jeff has a 20+ year career developing and manufacturing consumer and electronic products. He has held executive roles in general management at Flextronics and Crocs, with P&L responsibility for global business units as large as $1.5B. His background includes consulting and interim C-level roles in multiple start-ups. Jeff has an appointment as an Executive in Residence at the Leeds School of Business at the University of Colorado Boulder. He holds a BSME from the University of Texas at Austin, an MS in Manufacturing Systems Engineering from Stanford University, and an MBA from the Stanford Graduate School of Business. Dr. Zoya Popović is a Distinguished Professor and the Hudson Moore Jr. Endowed Chair in the Department of Electrical, Computer and Energy Engineering at the University of Colorado Boulder. Since 1990, Dr. Popović has advised the Microwave & RF Research Group at the University of Colorado. Dr. Popović received her Dipl. Ing. degree from the University of Belgrade and her M.S. and Ph.D. degrees in Electrical Engineering from Caltech. She is the recipient of numerous honors, including being named a White House NSF Presidential Faculty Fellow, an IEEE Fellow, a two-time winner of the IEEE Microwave Prize, and numerous teaching awards. Dr. Josh Lee earned his PhD and Masters in Exercise Physiology from the University of Texas at Austin where his research focused on cardiovascular and cerebrovascular responses to thermal stress. He has published numerous studies on the topics of thermal stress and cardiovascular function; the influence of heat stress on blood pressure regulation and brain blood flow; and the impact of head, skin and core temperature on athletic performance. Josh also gained clinical research experience as a post-doctoral fellow at the University of Utah where he investigated underlying mechanisms of exercise intolerance in patients with various types of heart failure. Josh has significant first-hand experience with thermal challenges to athletic performance as a competitive endurance athlete with achievements that include... 10+ IRONMAN finishes, four at the World Championships in Kona; two-time racer at XTERRA World Championships in Maui; a sub-9 hour Leadville 100 MTB finisher; plus experience racing in the Texas heat as a category-2 road cyclist. Headquartered in Boulder CO, gaugewear, inc is a seed stage start-up commercializing wearable sensors based on research from the University of Colorado Boulder. Independent analysts estimate the market for health and fitness wearables will approach $16B by 2020, and the global thermometry market will exceed $6B. Using unique, patented technology, gaugewear is providing new wearable sensors to address these markets. Josh attended the Korey Stringer Institute Annual Gala, hosted at the NFL Headquarters in NYC. Congrats, Parisa, on defending your PhD dissertation! Will measuring the temp of water inside his mouth with the wireless proto. Congrats, Zoya, on the huge donation for RF research! We love to chat about what we are working on and progress in the field. Non-invasive, wearable, core body temperature sensor.